Even though there still plenty of hollowing candy hanging around, it’s not too early to start thinking about the upcoming holidays. Before you know it, you’ll be call up in a whirlwind of shopping, baking, parties and school recitals. Things tend to get busy fast at this time of the year. That’s why you want to take care of as much of your household “to do” list as possible. If you put off clearing clutter from your garage, basement, closets and attic, then now is the time to bring in Junk King Albany to get that job done. A lot could have changed around the house since the last time you decorated for the holidays. Consider all the “extra stuff.” There can certainly be a lot more discarded items that have piled up in your garage where you keep the decorations. As you fight your way through those boxes, you may be asking yourself, “why my holding onto all the stuff?” Anything you haven’t used in at least a year should be considered rubbish and can be tossed out. But that doesn’t automatically mean it is going to end up in a landfill especially not with Junk King Albany on the job. Junk King Albany goes out of its way to drop off most of what they collect at charitable organizations. These are the folks that can put things like old furniture, dishes, pots, pans and appliances to use again. You don’t have to worry about how far out of the way the Junk King crews will go to make these drop-offs. It’s all part of their junk removal package. Junk King is going send over two movers who to do all the hard work for you. That means is no limit with regard to weight or size when it comes to getting rid of something. What about those things that won’t even fit out the front door? A lot of stuff gets built inside the house that needs to be taken apart before it can be tossed out. The Junk King crew will happily take care of dismantling anything you want to get rid of. If you want to have clutter free holidays, then hire Junk King Albany today. This entry was posted in Albany Junk Removal and tagged clutter, holidays, Junk King, junk removal on October 31, 2017 by Junk King. Last updated October 31, 2017 . When it comes to actually being scared, most people would prefer not to be frightened. However, that doesn’t stop them from watching horror movies or going to haunted houses especially at this time of the year. Halloween is when we all intentionally set out scare ourselves. 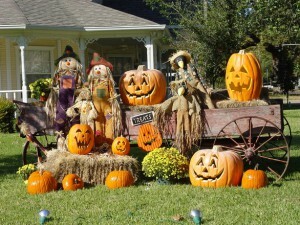 It is all done in the name of good fun and that certainly applies to decorating your home for Halloween. What was once a well-kept manicured lawn can be turned into a ghoulish cemetery inviting trick-or-treaters to ask for candy if they dare! It would be horrible if your neighbors thought you decorating your front yard for Halloween when in fact you didn’t do anything. That can only mean you’ve got a lot of yard rubbish that needs to be cleared up. Instead of scaring your neighbors away, call in Junk King Albany. As with any other part of our homes, our yards have a tendency to fill up with all types of clutter. You are certainly not going to bring in some old tires or auto parts into your living room. If you’ve got construction waste left over from a remodeling project, then it can be stored in a bedroom. All of those items can pileup along the side of the house or garage. They can also make their way under your porch. Creating those kinds of clutter zones is an invitation to pests like roaches, spiders and termites. That’s why you never want to hang onto that kind of rubbish. One call to Junk King Albany makes it all disappear. Cleaning up yard rubbish will no doubt be a bit messy. But you don’t have to worry about getting your hands dirty. The crew from Junk King Albany is going to do all the work for you. They’ll have all the proper equipment including work gloves, moving dollies and other tools needed to lift, load or disassemble anything you want to get rid of in your yard. You can book your session with Junk King Albany. You can also schedule it for a time that works best for your calendar. If you need to clear way yard rubbish, then Junk King Albany is the best option in town. This entry was posted in Albany Junk Removal and tagged Halloween, Junk King, rubbish on October 22, 2017 by Junk King. Last updated October 22, 2017 .